Agalmyla is a fairly large genus of approximately 97 species belonging to subfamily Cyrtandroideae tribe Trichosporeae. Wild populations are found throughout much of Malesia (Sumatra, Borneo, Java, etc). Superficially, they resemble the more commonly cultivated genus Aeschynanthus. They are typically perennial climbing vines, but a few species are fully terrestrial and shrub-like. Agalmyla species have short roots along the length of their stems that are used to cling to the trees they are climbing. Leaves are opposite and generally of different sizes, but in the fully terrestrial species the leaves of each pair are of equal size. Flower clusters develop in the axils with many flowers forming in a small area. The sepals are usually fused into a cone and the corolla is typically curved. The corolla is usually red, but may have black or yellow in the throat. Other colors, like orange and green do occur though. Flowers have 5 lobes with the upper lip formed by 2 of the lobes, 2 lobes lateral to the upper lip, and 1 lobe directly below. In some cases the upper lip is formed by both the upper 2 lobes and the 2 lateral lobes, leaving only 1 lobe below. The 2 or 4 stamens occur in pairs that may or may not extend beyond the corolla opening depending on species. The seed pod is long and cylindrical, opening by 4 valves. Seeds have a thread-like appendage at each end that likely aids in their dispersal by wind. The typically bright coloration and long tube of the corolla suggests that pollination is via birds. In 1968 Burtt subsumed both Dichrotrichum and Tetradema into the genus. Later, Hilliard and Burtt (2002) divided the genus into three sections. Section Agalmyla– leaves of different size in each pair, the smaller is scale-like, flowers have patches of hairs in the corolla tube, and 2 or 4 stamens extending beyond the corolla opening. Found in Borneo, Java, Malay peninsula, Palawan, and Sumatra. Section Exannularia– leaves of different size in each pair, smaller leaf has a petiole and leaf blade, found in Sulawesi and islands nearby. Section Dichrotrichum– leaves of different size in each pair, smaller leaf has a petiole and leaf blade, flower clusters held on stems that branch to each individual flower, 4 stamens that rarely extend beyond the corolla opening. Flowers have a corolla or 5 patches of hair. Found in Moluccas, New Guinea, and the Phillipines. 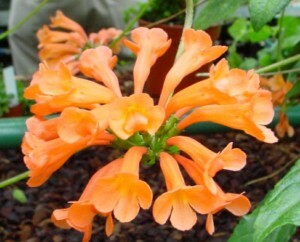 Agalmyla is not often seen in cultivation. Plants can become large and require trellising to reach their full potential. Perhaps one notable exception is A. parasitica, which is cultivated with some regularity.